A 1927 Bugatti Type 40 driven by Mark Gessler and his son, Kurt, on the 2018 1000 Miglia. Photos by Riccardo Palazzani, courtesy Historic Vehicle Association. Each May, the 1000 Miglia – the modern evolution of the storied Mille Miglia endurance race – draws teams and spectators alike to Italy for four days of time-speed-distance rallying in classic cars. 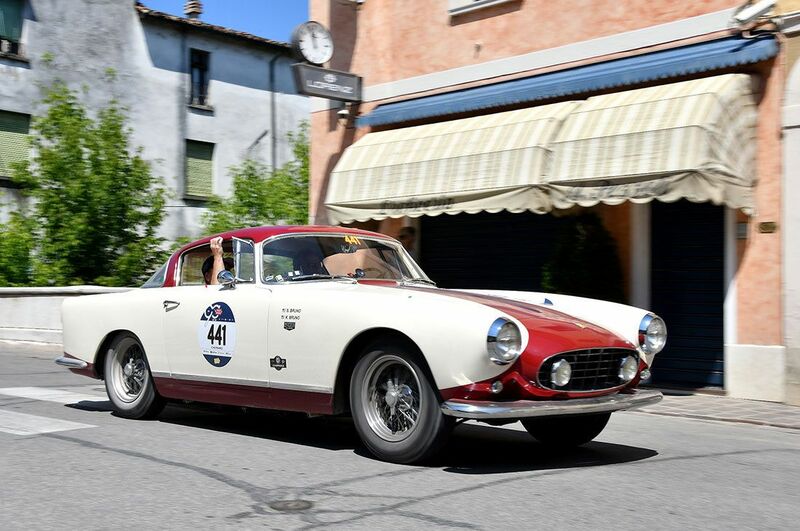 This weekend, 1000 Miglia S.r.l., in conjunction with the Historic Vehicle Association (HVA) and the Italian Embassy, is bringing a taste of the event to the U.S., as 18 cars will compete in the in the one-day 1000 Miglia Warm Up USA, taking place on roads in Washington, D.C., Northern Virginia, and Maryland. 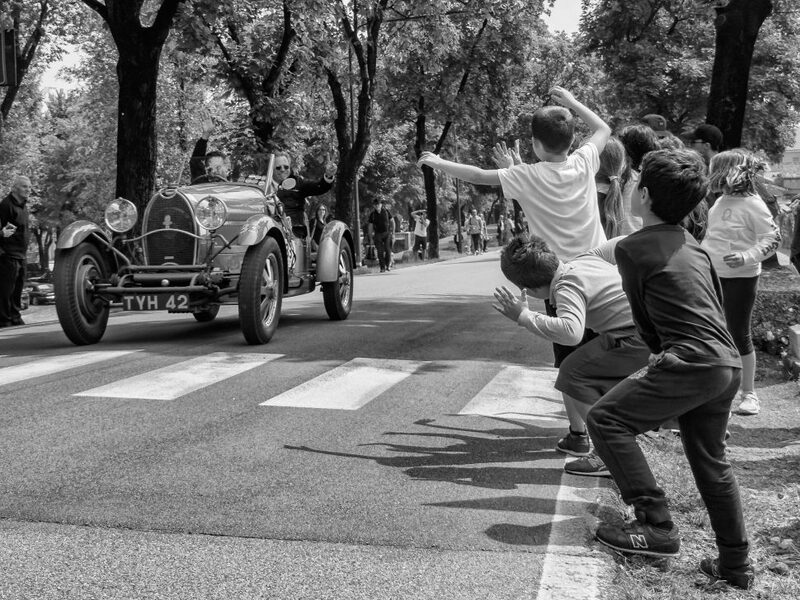 First run in 1927, the Mille Miglia was a race from Brescia to Rome and back again, held on public roads typically lined with enthusiastic crowds. 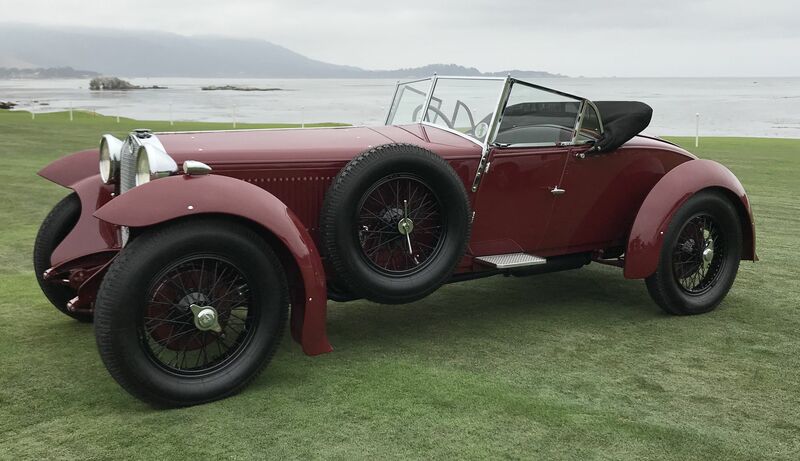 In 1928, the first American cars – specifically, two La Salles (Cadillac’s companion brand) and a pair of Chrysler Model 72s – entered the race, and though the Chryslers failed to finish, the La Salles placed a respectable 26th and 15th overall, earning a class win. Fernando Minoia won the first 1000 Miglia race in 1927 and was persuaded to drive the new La Salle (no. 94) in the 1928 race. While he won his class he sadly finished two hours behind the winning Alfa Romeo 1500 SS which was lighter, more agile and quick. 1928 Alfa Romeo SS 1500 Atcherly. 2018 was the 90th Anniversary of Alfa Romeo’s first win at the 1000 Miglia with the supercharged, 6 cylinder 1500 cc Super Sport model. This particular example was shipped to the UK where it received body work by Atcherley. The car is today owned by an Atcherley family member and was shown this summer at the Pebble Beach Concours d’Elegance. The Mille Miglia grew in status internationally as well, becoming a round of the World Sports Car Championship from 1953-’57. Though always a high-risk event for drivers, two fatal accidents in 1957 proved too much for the event to endure. One crash claimed the life of Ferrari 335 S driver Alfonso de Portago and his co-driver, Edmund Nelson, along with nine spectators, including five children. The fatal crash of Joseph Göttgens, piloting a TR3, sealed the fate of the Mille Miglia, at least as an open-road race. 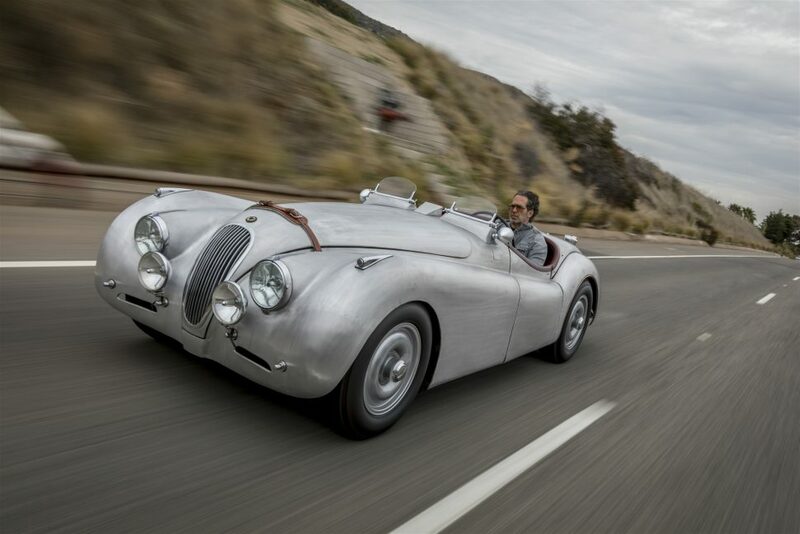 1950 Jaguar XK120 alloy roadster. Jaguar’s launch into the post-war market was with this stunningly streamlined roadster featuring a 3.4 liter 6 cylinder with 162 hp. The first 240 cars featured lightweight aluminum alloy bodies until production was later shifted to steel bodies. It was a sensation at the 1948 motor show and in 1949 excitement was further heightened when it was able to reach 132 mph on a speed run in Belgium. This car is one of the 184 alloy roadsters delivered with left-hand drive. It would be two decades before the event resumed, this time as a time-speed-distance rally – still held on public roads, but at more sensible speeds – retracing the route of the original. 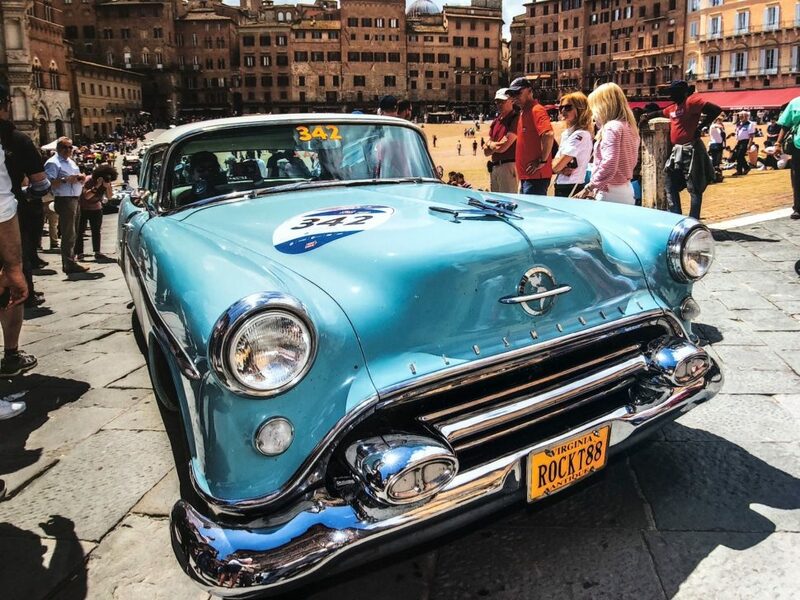 Today, the 1000 Miglia is the world’s largest historic motoring event, drawing 450 classic cars (plus 150 more contemporary models for specialty events) and thousands of fans from around the world for the 2018 event. As Francesca explained to us, the logistics of such an event are staggering, requiring as many as 2,000 support vehicles to make sure each leg goes off without a hitch for teams, spectators and support personnel. 1954 Oldsmobile Super 88 Coupe. Back in 1954 the Oldsmobile Rocket 88 was a weapon of choice on the NASCAR circuit with 11 victories. The huge 5.1 liter “Rocket 88” engine was GM’s the top performance V8 and Oldsmobile was being promoted as global brand. It’s not surprising that an Oldsmobile Super 88 was campaigned in the 1954 1000 Miglia. These huge beasts were unusual in Italy then and remain crowd pleasers today but are handful to manage on narrow village streets. 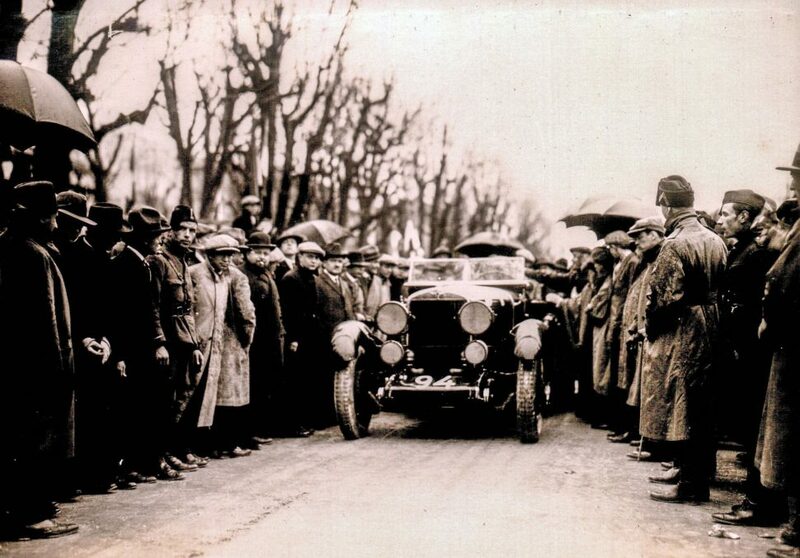 To participate in the modern 1000 Miglia, cars must have been eligible to compete in the original Mille Miglia. Per Mark Gessler, president of the HVA, about 900 different models ran in the original, giving prospective modern entrants a wide range of vehicles to choose from. 1956 Alfa Romeo Giulietta Sprint Veloce Lightweight. 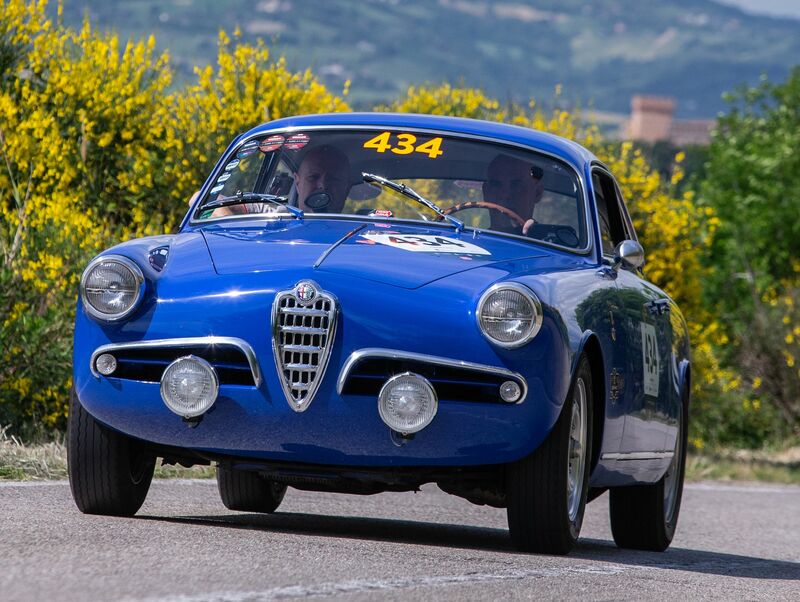 This 1956 Alfa Romeo Giulietta Sprint Veloce Allegerita competed in the last original 1000 Miglia race in 1957. It is much lighter than the stock version Giulietta Sprint with its aluminum doors, trunk and hood and has more highly tuned engine by Conrero. 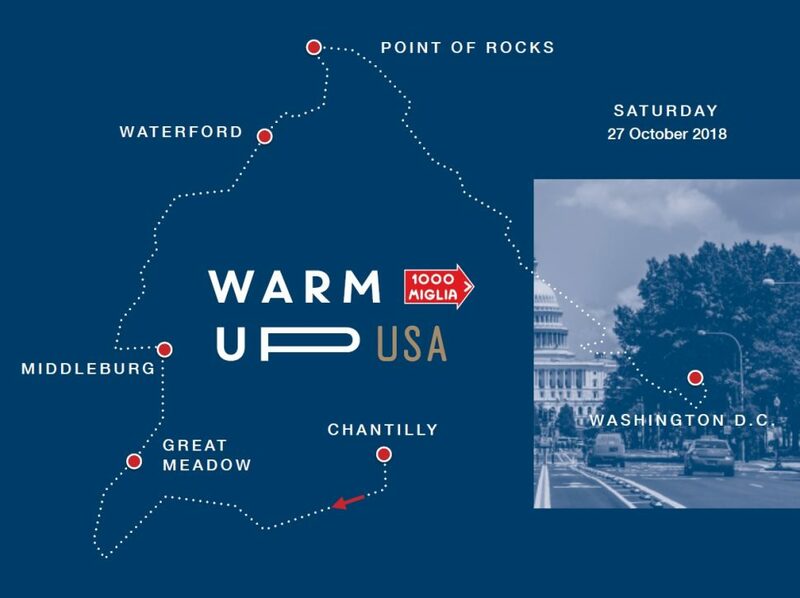 Which is why the 1000 Miglia kicked off a one-day “Warm Up” in the UK last April, and why it’s bringing a two-day “Warm Up” to Washington, D.C. this weekend. Just 18 cars will participate in the USA rally, including a 1927 La Salle (significant, since this is the 90th anniversary of La Salle’s first Mille Miglia), a 1927 Bugatti Type 40A, a 1928 Alfa Romeo SS 1500 Atcherly, a 1951 Cisitalia 202 cabriolet, a 1950 Jaguar XK120 alloy roadster, a 1954 Oldsmobile Super 88 coupe, a 1957 Ferrari 250 GT Boano coupe, a 1956 Alfa Romeo Giulietta Sprint Veloce lightweight, and others. Friday’s activities include briefings and training sessions, giving competitors the knowledge and skills they’ll need to compete successfully on Saturday’s 150-mile rally. Though the exact route remains a secret until the day of the event, Middleburg Academy in Middleburg, Virginia, will host a checkpoint. As Francesca explained to us, the students there were fascinated by the event and by the cars expected to participate, proving once again that generalizations about teens preferring electronics to internal combustion aren’t always accurate. The key, she believes, is exposing younger generations to the experience of events like the 1000 Miglia, which make history more accessible. 1957 Ferrari 250 GT Boano Coupé. The Ferrari 250 features a 3 liter V12 engine and was built as an exclusive road going grand tourer or GT. This is one of only twelve of these beautiful coupes built with a lightweight aluminum body. Stephen and Kim Bruno have competed with car in the 2017 and 2018 1000 Miglia.